Just as you can import contacts into the Address Book and Children module, you can similarly import giver data into the Giving module. So if you have a pre-existing system that you're transitioning from, we've made it really simple to get that existing data into your ChurchSuite account. To upload your Giver data into the Giving module, it needs to be in the form of a .CSV (Comma separated value) file. 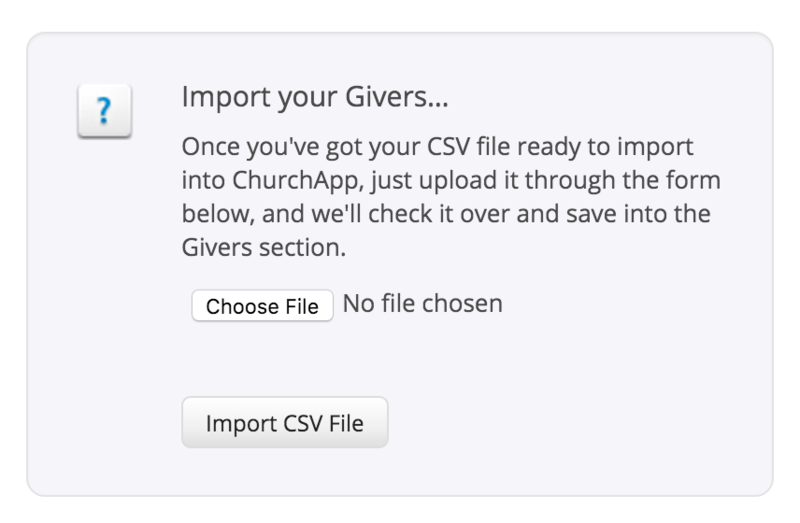 Make sure that the first row contains the correct header information, which ChurchSuite will use to match your data to the correct field in the Giving Module giver records. There is a full list of the types of data with the relevant header information on the "Import Givers" page in ChurchSuite. 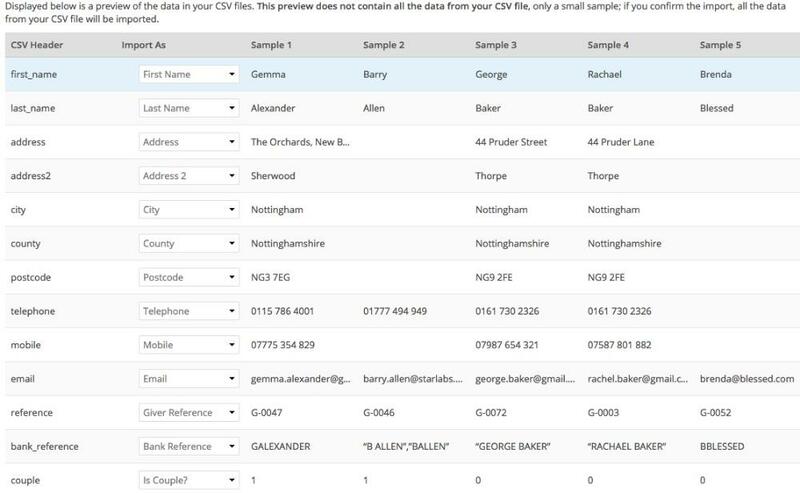 Note, you don't have to include every field in your CSV file, but ChurchSuite will import every column from your CSV file that has header information it recognises. Note: When importing data on a multi-site account, the site you're currently browsing is the site the giver data will be imported into. Be sure to select the correct Site before proceeding. Go to "Giving" > "Givers" and click "Import Givers". On the next "Import Givers" page, click "Choose File" and browse to the location of your CSV file. Then, click "Import CSV File". ChurchSuite will this display a preview of your data so that you can check all incoming data is being matched to the correct field in ChurchSuite. Once you are satisfied everything is correct, scroll down and click "Import All Givers" to complete the import. Alternatively, you can click "Cancel Import" if you discover you need to address problems with your CSV file. A typical problem might be a duplicate Giver Reference - simply cancel the import, fix the reference in your CSV file so that references are unique, then return and re-import your CSV file. During the import process, ChurchSuite will attempt to link your imported givers to your Address Book contacts based on first name and last name. After you have completed the "import givers" process, we recommend you use the "Giving" > "Reports" > "Potential contacts" report to help identify and match any remaining unlinked givers to possible existing Address Book contacts. A tag is automatically created for each contact or child that is imported. The format of the tag is: Import <date time> where <date time> is in your local format e.g. Import 01-01-2017 11:59am. This will be useful if you encounter a problem after import (e.g. you missed a field during the import). With a Tag you can easily delete just those imported Givers and re-run the import process again. You may delete this tag when it is no longer relevant. Clear Errors - If any errors are detected the report will continue to be displayed until the 'Clear Errors' button (at the top right) is clicked and confirmation that the errors are to be deleted. reference An internal reference you use to identify this giver for your records. bank_reference The reference that will be used to identify this giver when importing donations. If there are multiple bank references for this giver, separate them with a comma "JOEBLOGGS","JBLOGGS"